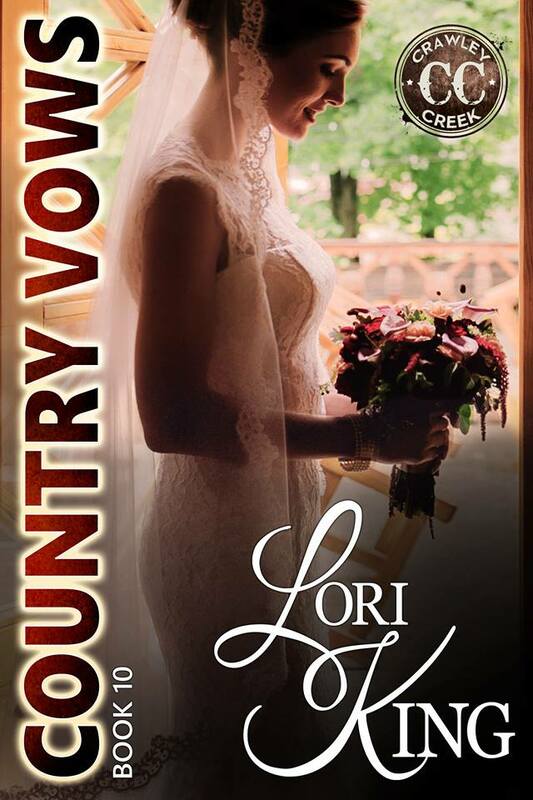 Lori King Books | Instead of wooing you with candles and moonlight; I'm kicking open the bedroom door! This page is intended for individuals over 18 years of age. It’s coming soon I promise! I’ve been working on the next book in the Crawley Creek Series, which turns out to be Country Vows, the story of Hawke and Jeanette’s wedding, plus a new baby in the Crawley family and lots more. Watch for it in April! Tomorrow (Dec 1) kicks off my annual reader appreciation 12 Days of Christmas event! Join my reader group on Facebook The Brat Pack, and you can participate! *** Items marked with this symbol at the end are open to international bidders – if you want to bid on a US only item, you will be responsible for paying the shipping in ADDITION to the amount you bid if you win. Chocolate is absolutely amazing. So is fudge. And Christmas. And did I mention fudge? This unique recipe from Betty Crockerallows you to shape the fudge however you want. If your household is anything like mine, this won’t last much longer than the time it takes you to pull it out of the cookie cutters and set it on the counter! This fudge is by far one of my favorite recipes. It is so easily alterable. If you want nuts, add nuts (probably only 1/4 to 1/2 of a cup though). If you want mint fudge, add 1 tsp of mint extract. You get the point; alter it to make it how you want it. Or you can just leave it plain like I do. 🙂 Either way, it is a fabulous Christmas treat! Melt the chips, butter, and milk in a double boiler on the stove. You can also put this mixture in the microwave to melt it, but I find it is easier on the stove. It melts better and it is harder to burn. Once everything is melted and stirred smooth, add in the vanilla. This is the point where you would stir in any other ingredients you could possibly imagine. Take your cookie cutters and grease them. Wrap the bottoms in foil making sure it is tight. You don’t want any of that delicious fudge leaking out! Place your wrapped cookie cutters on a cookie sheet. Pour your fudge into the cookie cutters. Fill them as full as you want, but make sure to leave room for candy decorations (if you want them). Put the cookie sheet in a fridge and let it set for about an hour. You want the fudge to be solidified just enough to place the candies on top. If you put the candies on when the fudge isn’t quite solid enough, you run the risk of them sinking. Once your decorating is all done, place them back in the fridge for another hour or two. Carefully remove the foil and push the fudge out of the cookie cutters. Make sure you do this when you are the only one home or you won’t have anything to show for all of your hard work! They will eat it all! Trust me! In the bowl of an electric stand mixer cream together butter and sugar until well combined. Mix in almond extract. With mixer set on low speed slowly add in flour and mix until combined (it will take a while and will appear dry and sandy at first but it will start to come together). Mix and fold in sprinkles. Press dough into an even layer in prepared pan (I did it with my hands first then used the bottom of a flat measuring cup to help smooth it out). Chill dough in refrigerator 20 – 30 minutes. Meanwhile preheat oven to 350 degrees. Lift dough from pan using parchment overhang on all sides. Cut into 1/2-inch squares using a large sharp knife (it works best to just cut long rows). Sprinkle more sprinkles over the top if desired and gently press into dough. Transfer about 1/3 of the cookies to an unbuttered baking sheet (also do not line pan with parchment or silicone liners) and scatter cookies out spacing cookies 1/2-inch apart. Bake in preheated oven 8 – 12 minutes (keep remaining that aren’t currently baking refrigerated). Repeat process with remaining bites, adding them to a cool baking sheet. Cool completely then transfer to an airtight container and store at room temperature. I was introduced to a old family tradition of making some Rosettes so I just had to try an easy Rosettes Cookie recipe. These cookies are very light and crispy. The recipe may be simple but I quickly learned there is a special technique that you need to master to make these Rosette cookies the easy way. If you don’t know the tricks it can become a huge fail real quick. I am very happy to write them all down so you can get them right the first time! I even created a video for you (and I hate creating videos)! First things first. You need to have a Rosette Mold to make these cookies. This is the one use. It’s the NorPro Rosette Iron set I found on Amazon. It ships fast and it’s inexpensive too! I received mine in two days which is good to know if you plan to make these for Christmas. The photo on the box shows you can add two molds and make them at once but I couldn’t do this. Further more, I wouldn’t want to do this. Here’s why. Each mold is a different size and shape. Each size will cook differently and it could be a matter of seconds before your Rosette is way to crispy. You don’t want to make two at the same time for this exact reason. There are other Rosette Iron sets made of Cast Iron too. See them all by clicking here on this Amazon link. Either set is great. The cast iron will definitely be heavier though. The one thing to make sure you take note when buying your set is to make sure it has a wooden handle. It’s extremely easy to make a lot of these cookies when you have a handle that is pretty comfortable to use. I would not buy a set that didn’t have this type of handle. Next you need an Easy Rosettes Cookie Recipe. I’ve tried a couple different recipes. There is a recipe that is included in the box that is good but I like to make a lot of cookies at once. Here is a recipe that will make about 50+ cookies depending on how big your Rosette mold is. Milk Substitute idea: You can use regular milk as a substitute and it will come out just fine. I’ve had to do this before. Just make sure you use 2 cups of milk instead of the condensed milk and water. Your liquids should always equal 2 cups. TIP: If you dust them in powdered sugar make sure you do this just before you serve them. Let them cool and sit for a while so the grease can settle. If not they will absorb into the cookie and become very soggy if you do it too soon. You can get all kinds of creative with these cookies when you add food coloring too. Let your imagination go wild. You should have a batter that looks a bit like pancake batter but the consistency is a bit more watery. When you start making your cookies you will need to mix this batter every so often because it will settle after a while. I mix it once or twice after about every 20-25 cookies I make. This recipe makes a lot of cookies. Sometimes I will make half of them and then put the batter in the refrigerator overnight and make the rest the next day. It keeps well in the refrigerator but only for another day, maybe two at the most. I don’t like the waste the batter. First and most importantly make sure your oil is at about 350 degrees. I use a thermometer to make sure I am at the right temperature. There’s no guessing the temp. You need a good thermometer! I really, really like this Polder Deep Fry Stainless Steel Thermometer because it has a handle on the back of it. This handle allows it to sit on the edge of your pan without touching the bottom of the pan and without you having to constantly hold it over that hot heat. It’s inexpensive too! If your temperature is not right the cookies will absorb too much oil if it’s too low or burn real easily it the temp is too hot. I’ve noticed my stove top temperature gauge is on about a 3 or 4 setting once I get to the right temp. I like to use a frying pan because it’s big and shallow. I can make about three Rosettes at a time with a frying pan. I’ve used less oil when I use a sauce pan but it takes longer to make them. I can say that making three at a time if not for the first timer either. You have to be on the ball when you make these because they can burn quickly. If you are not quick, don’t make more than one at a time. Expect to throw out a few, break a few. They’re delicate, and even careful handling can cause some to break. Plan ahead so you have enough for your tray. Sprinkle the broken ones and eat them as you go. The kids will be begging for them before they are even done. That’s what I do. TIP: I created a video for you and if you listen closely right after I dip the oil in the batter and dab it on a kitchen towel to get the excess oil off, I put in in the batter but not all the way. You can hear a slight sizzle when I dip the rosette mold in the batter. You want to hear this sizzle. This means the rosette mold was hot enough and will allow the batter to cook slightly and grab just enough batter for your cookie. You really need to dab that rosette mold after you dip it in oil too. The reason? Because if you have too much oil on it the batter will just fall right off and not even stick to your rosette mold. (ask me how I know! lol) When I first did this I was afraid the batter would stick to the mold and not cook right if I didn’t leave some oil on but that’s not the case at all. Dip the mold in the batter long enough for it to heat up the very first time you start this process and then dab it a few times on paper towels or a small kitchen towel. It works perfectly when you do this. Frying Information: I started to count seconds when I was doing this to give you some sort of timeframe. When I dipped the rosette mold into the batter I left it for about 3 to 4 seconds. Then when I dipped the rosette mold with the batter into the hot vegetable oil I held it under the oil and counted about 10 to 12 seconds before I lifted it out. Most of the time if you do it exactly like this the cookie will fall right off of the rosette mold when you lift it up. If not, keep a fork nearby and just give a little tug with your fork to make it come right off as you can tell from the video that’s exactly what I do. I hope you enjoy this Easy Rosette Cookie Recipe as much as my family does. These tend to be a tradition around the holidays for many. 1. Melt the white chocolate almond bark according to the directions on the package. 2. Dip each mini twist pretzel halfway into the melted white chocolate almond bark. almond bark is showing. Place on waxed paper. half onto the side of each pretzel. Allow time for the almond bark to set. In medium microwavable bowl, microwave chopped baking bars uncovered on High 1 minute to 1 minute 30 seconds, stirring every 30 seconds, until melted and smooth. Gently stir in cereal, pretzels and raisins until evenly coated. 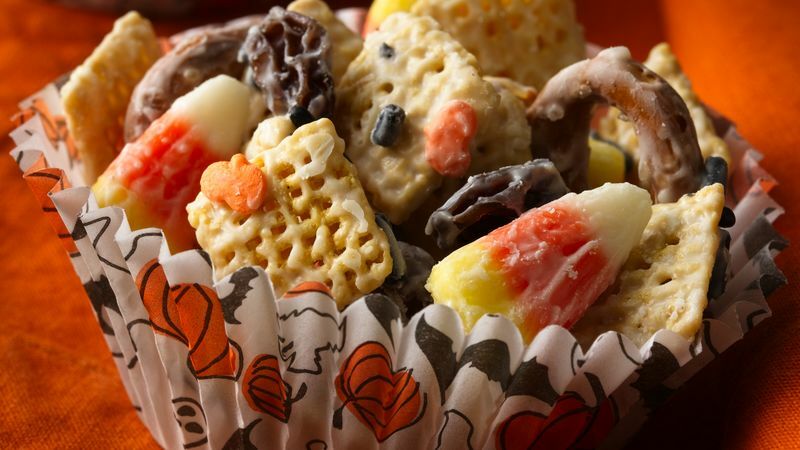 Stir in candy corn and decors. Spread on waxed paper or foil until cool and chocolate is set, about 30 minutes. Break into chunks. Store loosely covered. 1. Line an 8×8 baking sheet with parchment paper and lightly grease with non-stick cooking spray. 2. Spread the cookies and pretzels in the bottom of the pan. 3. Melt chocolate in a bowl set over a pan of simmering water, or in the microwave, stirring frequently until melted. Remove from the heat while there are still a few chunks, and stir until smooth. White chocolate burns easily.